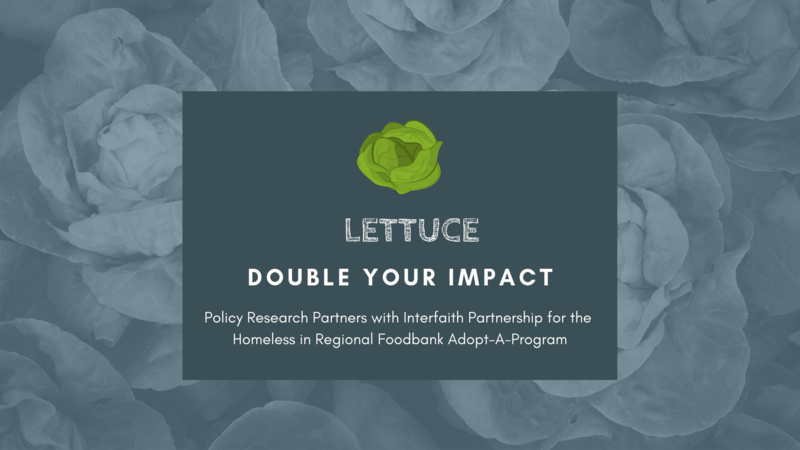 Policy Research Associates, Inc. (PRA) is proud to announce that it is partnering again with Interfaith Partnership for the Homeless (IPH) in this year’s Regional Food Bank of Northeastern New York’s Adopt-A-Program. PRA’s donation match will support IPH’s efforts in serving individuals and families experiencing or at-risk of homelessness in the Capital Region. PRA will match funds donated in IPH’s name through the Regional Food Bank of Northeastern New York from October 15 to November 2, 2018, dollar for dollar up to $2,500. To double the impact of your donation, visit the Regional Foodbank of Northeastern New York’s Standard Donation Form and enter IPH 188ES under the Adopt-A-Program section to complete your donation. After following these steps and completing your transaction, funds will be added to IPH’s account. IPH purchases food from the Regional Food Bank of Northeastern New York to serve more than 60,000 meals to its clients each year. The Adopt-A-Program stretches the food-buying power of IPH—for every $1 contributed to the Regional Food Bank Adopt-A-Program in IPH’s name, IPH will receive $10 worth of food to serve its guests. About Policy Research Associates, Inc.
Policy Research Associates, Inc. (PRA) is a Women-Owned Small Business that is a national leader in behavioral health and research. We offer four core services that help individuals with behavioral health needs achieve recovery. In partnership with our sister non-profit, Policy Research, Inc., we offer policy, research, technical assistance, and training services, primarily in the content areas of behavioral health; homelessness; benefit access; criminal justice; juvenile justice; service members, veterans, and their families; recovery support; consumers and family members; trauma; wellness; child welfare; and education. Interfaith Partnership for the Homeless provides services to individuals and families who are homeless or on the brink of homelessness. Major programs include the Emergency Shelter, the Sheridan Hollow Drop-In Center, the Housing Program, the Health and Wellness Program, and the Summer Youth Program. The Regional Food Bank of Northeastern New York collects large donations of food from the food industry and distributes it to charitable agencies serving hungry and disadvantaged people in 23 counties. From Plattsburgh to Newburgh, in urban, rural, and suburban communities, the Food Bank provides over 30 million pounds of food a year to 1,000 agencies.